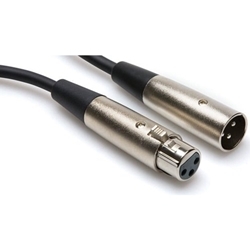 This microphone cable from Hosa features rugged silver-plated REAN connectors. Enjoy a clear signal, thanks to 20 AWG oxygen-free copper conductors and an impressive signal-to-noise ratio, by virtue of 90% oxygen-free copper braided shielding. If you’re searching for a quality mic cable that won’t break the bank, this offering from Hosa is worthy of your consideration. Hosa cables are built with the hard-working, hard-touring musician or audio professional in mind. Hosa cables are exceedingly popular, due in part to their reputation as being one of the most affordable and high-quality cable lines in the business. Hosa cables have also received praise for their durability and excellent performance. When it comes to audio cable design, Hosa keeps a steady eye on the basics, and you can hear this attention to detail in their sound.